Imagine if you will, Freaky Friday meets Superbad – the result being an amalgamation of body-swapping hi-jinks and foul language. But then imagine that neither of those movies were any good. That’s what The Change-Up feels like. The film is the result of poor writing and forced profanity in order to get laughs. Unfortunately even with two A-listers in the leads, the film falls flat more often than not. Mitch (Ryan Reynolds) and Dave (Jason Bateman) are two best friends who have grown apart to live completely separate lives. 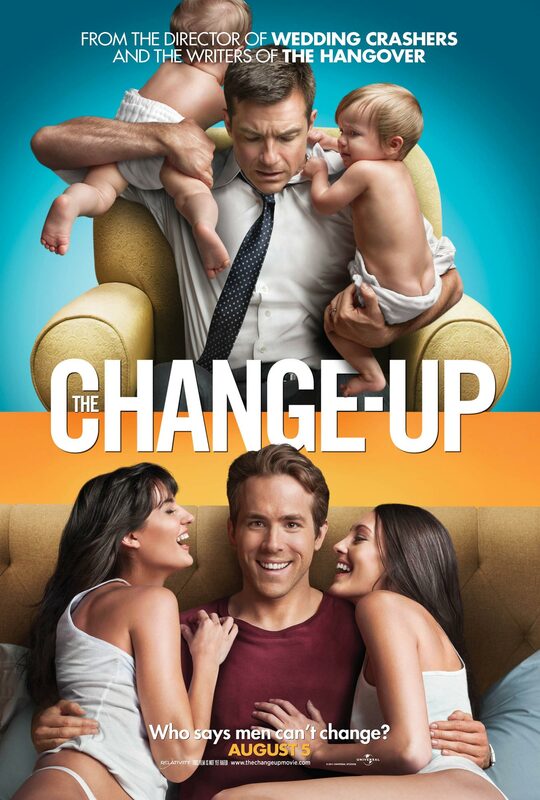 Dave is a lawyer, and him and his wife Jamie (Leslie Mann) have a daughter and two newborn twins that keep them up through the night. Mitch is a looking-for-work actor who shrugs off responsibility whenever he can and never finishes what he starts. As the old adage goes, the grass is always greener on the other side, and the two envy each other for their own reasons. After a night of drinking, the two stumble upon a fountain where they wish to be one another quite uniquely by urinating simultaneously into the water. The next day, they both wake up in the other one’s bed to find that they have somehow switched bodies. Of course when they try and find the fountain to reverse the swap, it is gone for restoration and being moved to an unknown location. The only thing they can do is live each other’s lives without destroying everything about them while they figure out what to do. We have seen this story before, time and time again. Two people wish to be one another, and when they get what they’ve asked for they realize just how good they had it. I think in theory, the concept is pretty funny. Instead of mother and daughter switching like we have seen several times before, it is two grown men that are polar opposites. And when you pack two strong leads like Ryan Reynolds and Jason Bateman who are both charismatic and likable, it seems like a formula for success. But as much as I wanted it to work, it simply didn’t seem natural. I like both of the actors, and they are great in comedies, but they just don’t have what it takes to do crude. Many of the lines felt so forced, as Jason Bateman in particular spits out line after line of profanity worse than what is in most Apatow films. They were definitely going to the shock factor, but it ended up just seeming tasteless. In movies like Clerks, Knocked Up, and Superbad – you actually believe that the actors might sound like that in context. But not here. Both Reynolds and Bateman are usually likable on-screen, but it was hard at times to find anything redeeming about their characters. Mitch, who starts off as Ryan Reynolds and ends up being played by Bateman for most of the film, is pretty much as unappealing of a person as you can find. He is lazy, rude and basically treats everyone he knows terribly. The way he talks to Dave and his family comes off trashy more often than funny. The movie is fixed from the beginning, because there is no way that Dave would ever want to live Mitch’s life. He has a great job, beautiful wife, wonderful children – and pretty much has a dream life. So he has to work and wake up to feed and change his newborns. Welcome to the real world. Once the two swap bodies, Dave definitely gets the raw end of the deal. I don’t blame the actors in the film for the failure – they do a decent job with what they are given. The problem is that they just weren’t given that much to work with. This isn’t the first time that director David Dobken has made a move about two friends that are a little wacky. Wedding Crashers was really good, and pushed some boundaries while still reeling it in when necessary. And the writers of this film, Jon Lucas and Scott Moore, wrote the characters for The Hangover and The Hangover Part II – so they definitely have experience with this type of script. But in the end, the dialogue felt much too unnatural and most of the jokes left a bad taste. Leslie Mann played her usual eccentric character, but was good in the role. Olivia Wilde plays Dave’s secretary, and a somewhat love interest of Mitch. She is probably more likable than either of the two leads, and is pretty funny during her interaction with Dave and Mitch in each other’s bodies. Alan Arkin shows up as Mitch’s father, who struggles with his son’s obnoxious lifestyle. And who could blame him? He does a good job for the brief screen time he gets. In the end, you might find a few laughs in The Change-Up, but they are few and far between. Jason Bateman’s character Dave is likable enough, but Reynold’s Mitch is pretty much irredeemable. It is hard to believe that after their body-swapping experience that he would ever be able to change his ways. The writing is pretty awful, and it is unfortunate that two funny actors have to struggle to try and make it work. It proves that this type of writing should be left to the experts like Kevin Smith and Judd Apatow, who know how to make the magic work. This one might be good for a late night video rental, but I wouldn’t suggest rushing to the theater to see it.